Today I took train and bus to visit Kiyomizu-dera Temple, more than a thousand years old, high on a hill overlooking Kyoto. 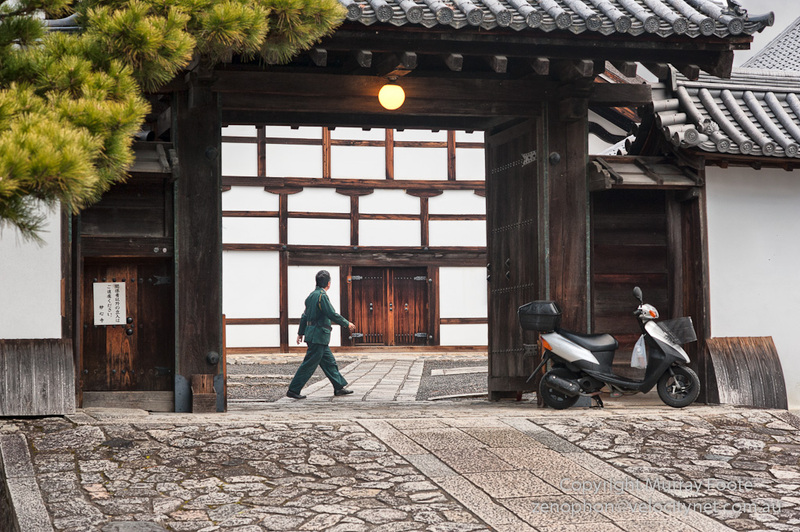 The road to the temple goes through the Higashiyama area, which is a traditional location for artisans including ceramics, wood carving and textiles. It is lined with shops and stalls. Some of them sell fast food and the rest sell a wonderful array of traditional items, the products of skilled artisans rather than tacky souvenirs. By chance in the image to the left I took the same young woman ascending the stair to the gate of the Temple as in the previous image. I didn’t even realise until I selected both images. The right-hand image features a young woman in traditional dress who was being photographed by her companion. 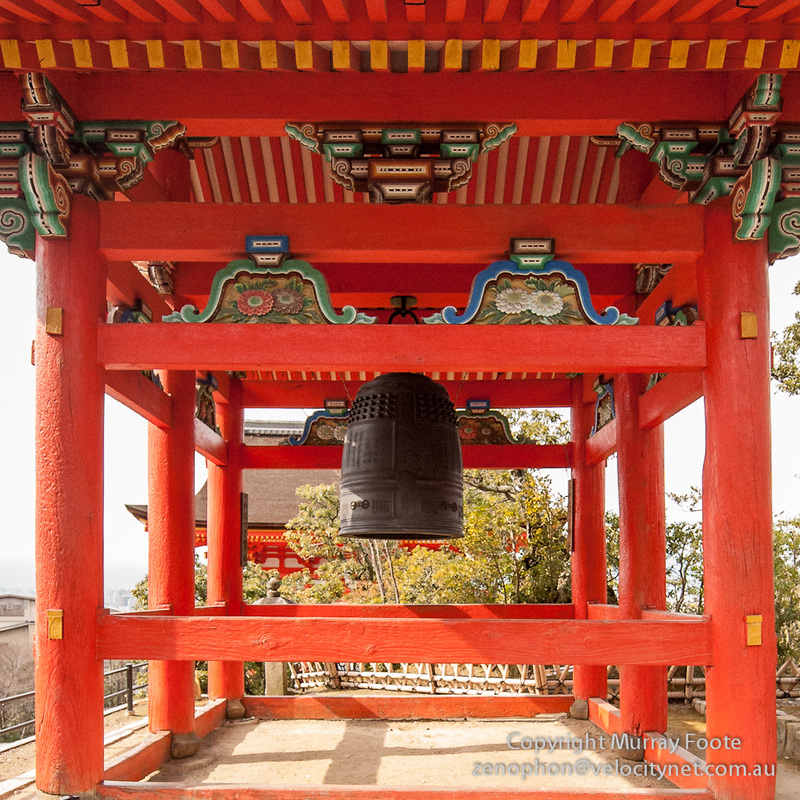 Near the gate is this huge bell, in a bright vermillion structure with colourful decorations. Here we are looking through an old gate close by the temple and in the distance (as I remember) a war memorial of some kind. Parts of the temple are under renovation, as you can see in the background to the right. The chain hanging down is like a drainpipe. 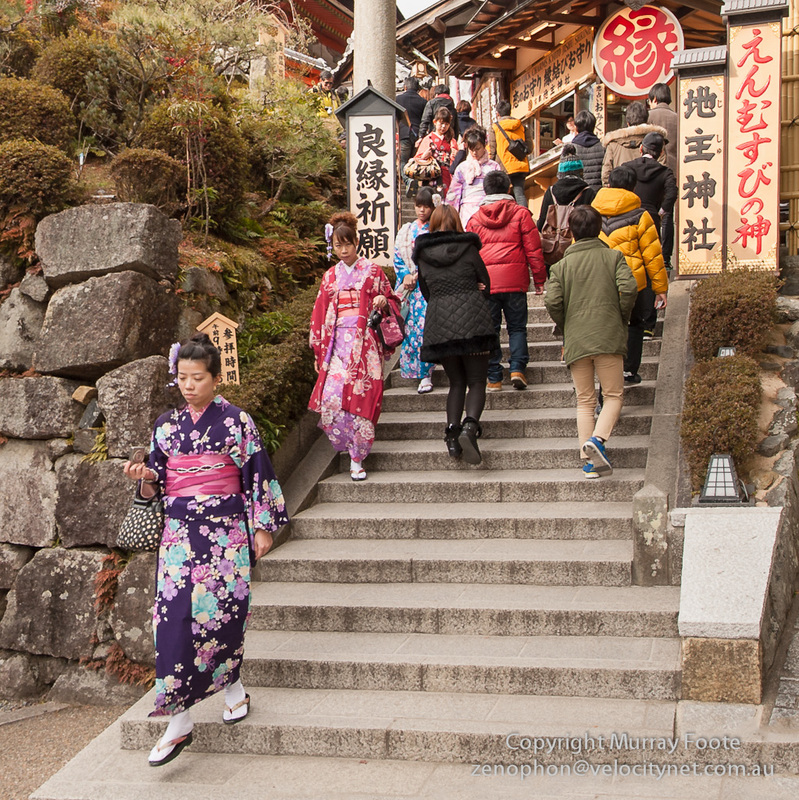 Behind the temple, these are the steps leading up to Jishu Shrine, a Shinto shrine dedicated to love and match-making. The shop further up is selling good luck charms, perhaps a little like the selling of indulgences by the medieval Catholic Church in Europe. 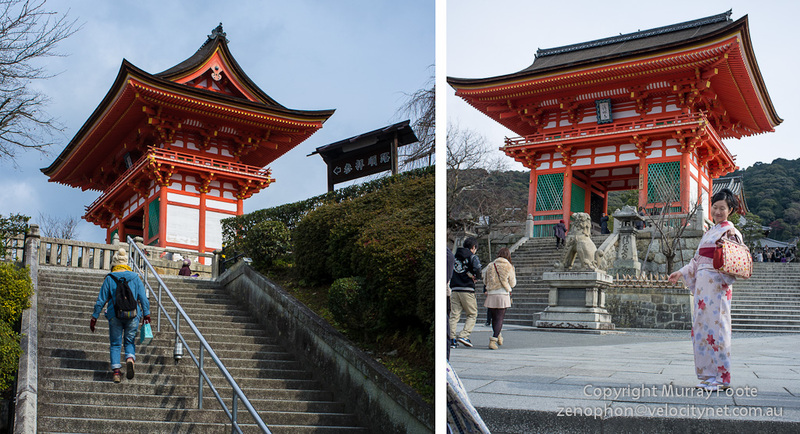 This is Jishu Shrine, beyond the top of the steps. 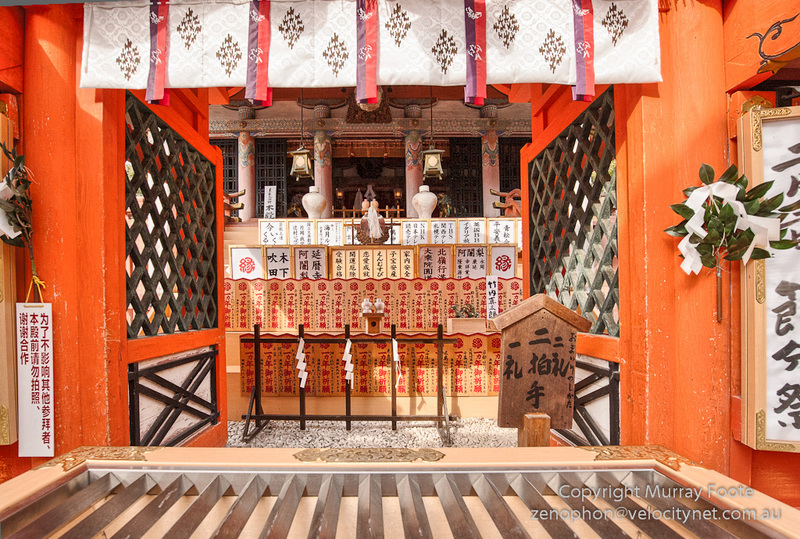 The wooden grate in front is where people throw offerings. Near the shrine there are two special stones set in the pavement nine metres apart. It is said that if you successfully walk from one to the other with your eyes closed, your aspirations in love will come true. (There were too many people around for a photograph of the stones and no-one doing the walk). 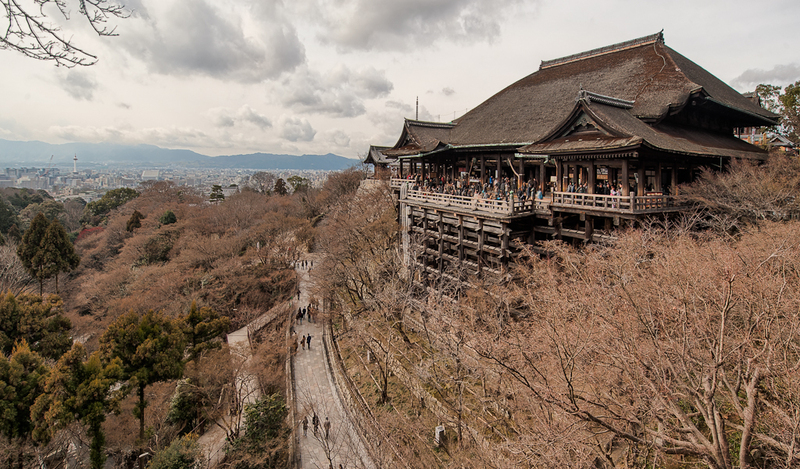 Here is a view of the massive Kiyomizu-dera Temple, with Kyoto in the background. 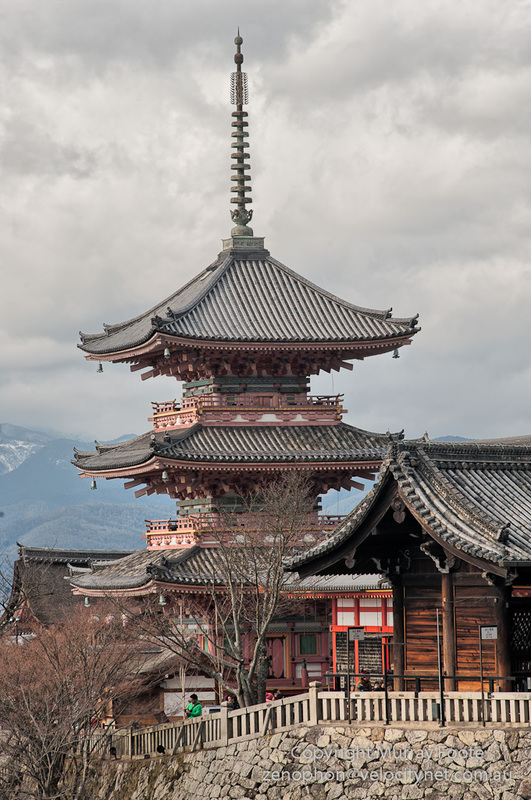 The temple was founded in 798, just after the capital moved to Heian-kyo (Kyoto) so it must have had particular significance in the Heian era (794-1185). The main hall is dedicated to the goddess of mercy and compassion and is supported over the edge of the cliff by 139 wooden pillars 15m in length. 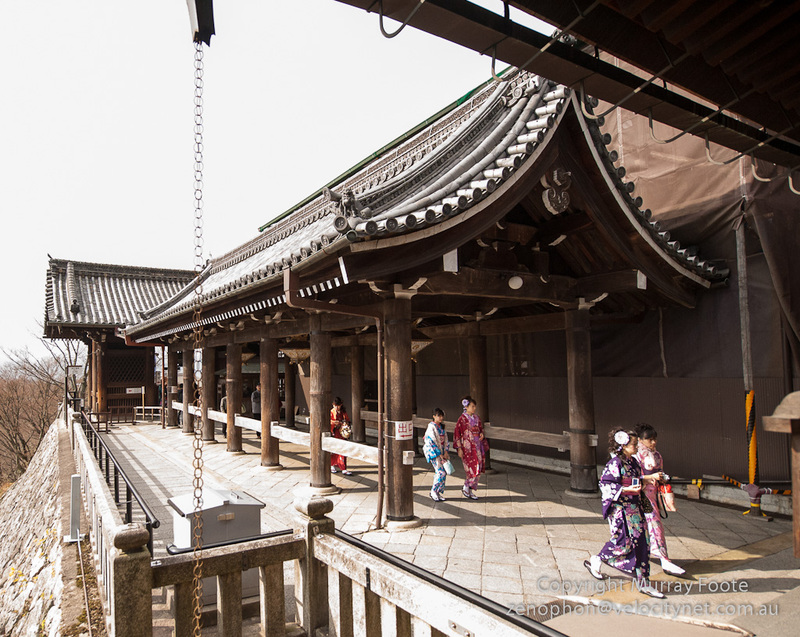 There is a saying in Japan that if you’re about to undertake some particularly daring act, you’re “jumping from the verandah of Kiyomizu Temple”. Apparently people actually used to jump, believing their wish would come true if they survived. 234 are said to have jumped and 200 survived. And here is the Koyasu Pagoda, in front of the temple from the front entrance though we are viewing from the side. The top of the spire is also visible in the previous image which was taken from the rear of the temple. The pagoda was rebuilt in 1633 after a fire, along with most buildings in the complex. It was also moved from another location in the complex in 1912. 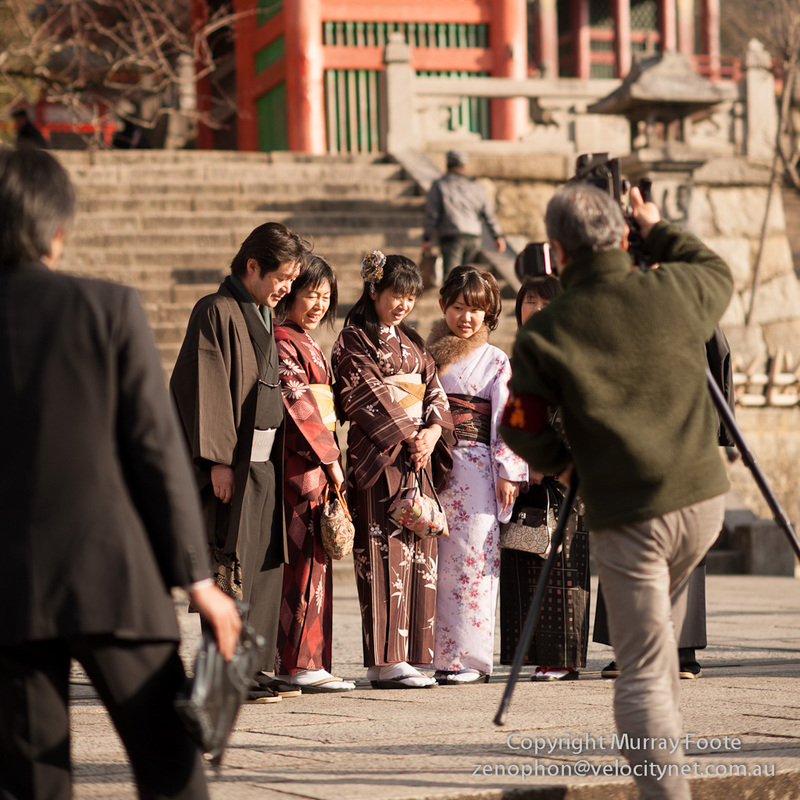 As I was walking out of the temple complex, I encountered some professional photographers in front of the vermillion Nio-mon Gate, taking photographs of a what I presume is a pre-wedding party. 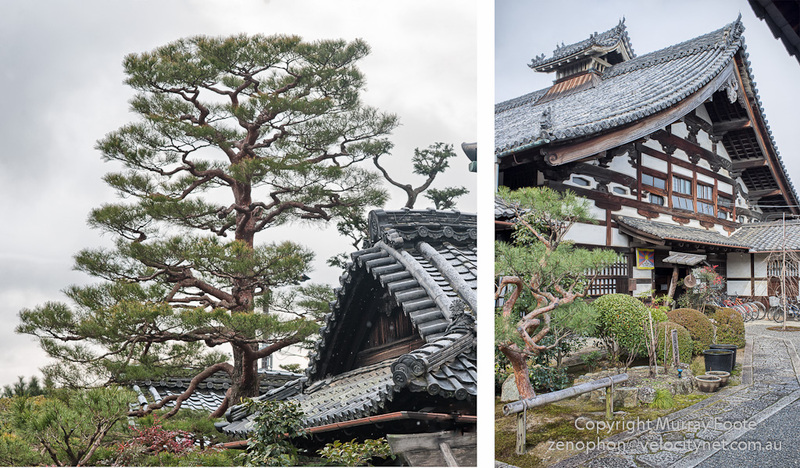 I also visited Kodai-Ji Temple but can show you nothing of this as photographs were not allowed, outside or inside. 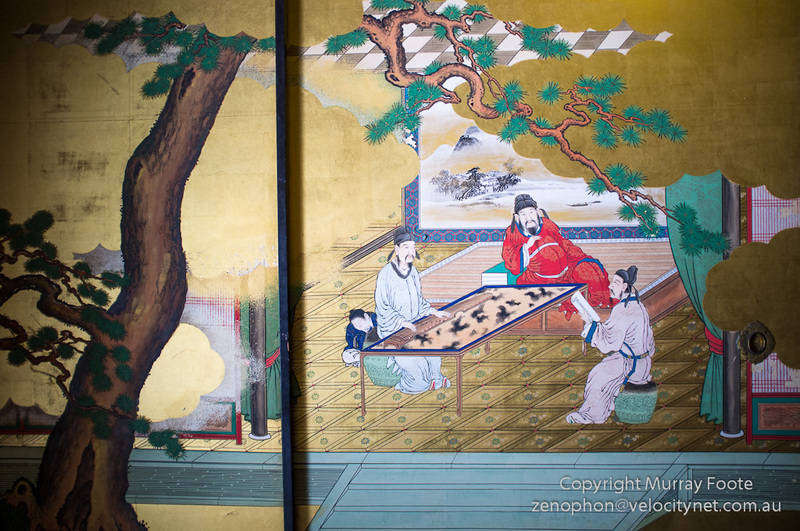 There were remarkable wall paintings and the highlight was an exquisite zen dry rock garden that left you no alternative but to sit down and contemplate. 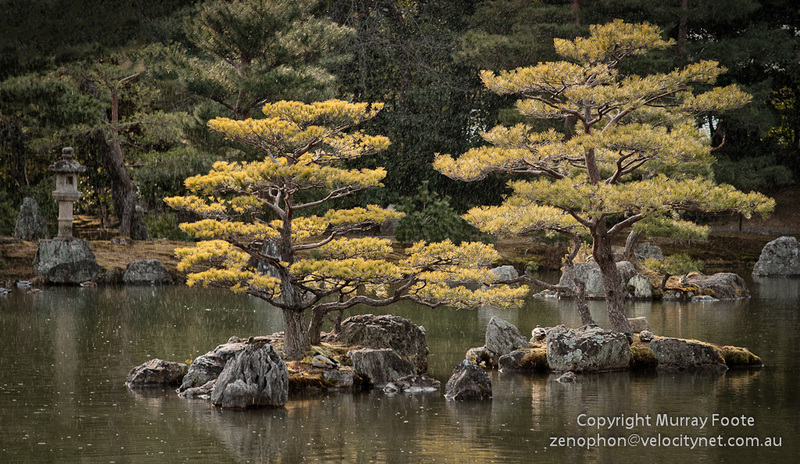 On the way back from Kinkaku-Ji, I visited Ryoan-Ji, a Zen Temple mainly famed for its dry rock garden. The garden and pond dates back to the 12th century. 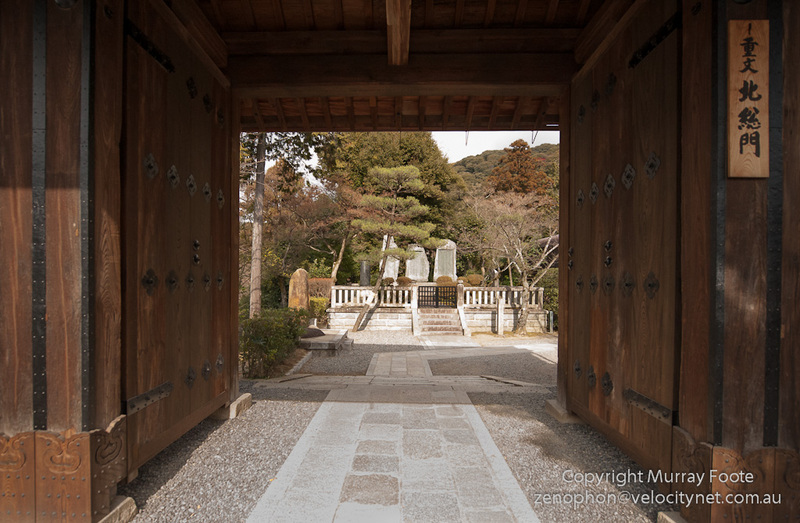 The red structure you can see through the trees is a Shinto gate associated with a shrine dedicated to Benten, a goddess of luck. The overall site was a Fujiwara estate during the Heian era (794-1185), in other words, the era of Classical Japan when the capital moved from Nara to Heian-kyo (later Kyoto). The Fujiwara were the dominant administrative family of the time and female members often married Emperors. 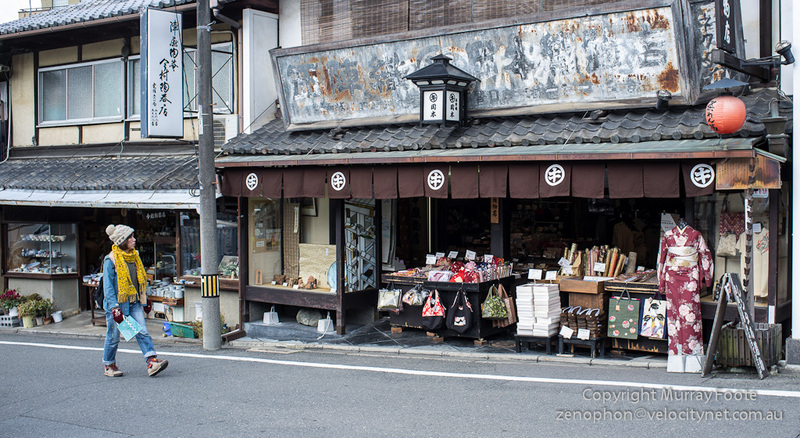 Above, on the left, the bamboo pipe and ladle are for ritual purification. 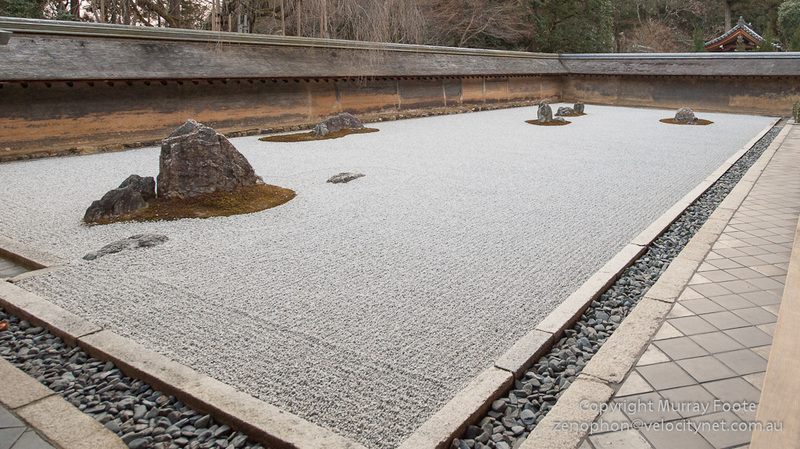 On the right, is a group of stones from Ryoanji's rock garden. You can see variations of the bamboo pipe and ladle on the left at many temples. Sometimes they are only for cleansing of the hands and sometimes for drinking the water. 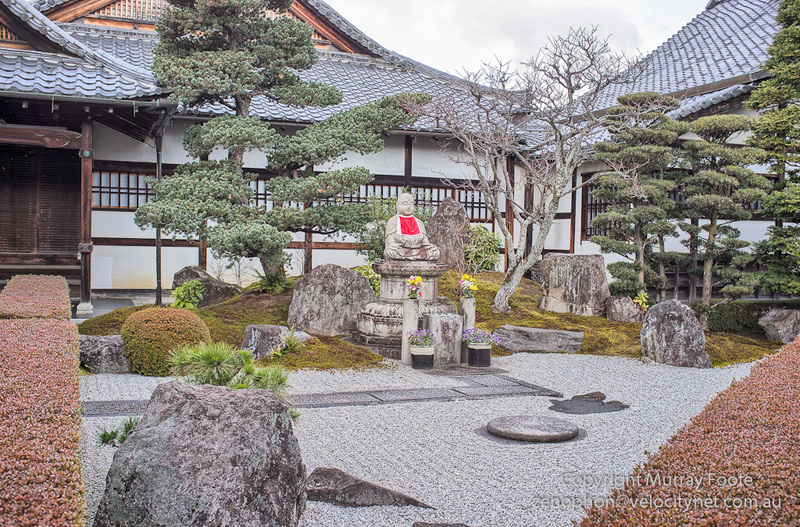 The Ryoanji zen rock garden, one of the most abstract of zen rock gardens, was constructed in the late fifteenth century. It is designed to be viewed from a long verandah that we are at one end of. There are fifteen stones and it is not possible to see any more than fourteen from any position along the verandah. It was designed this way because fifteen is said to be a perfect number and the garden demonstrates that perfection is not possible. Returning from the rock garden, here we are again at the lower pond and garden. I presume the building is part of the Shinto shrine (access was not possible). Walking back to my lodgings, I had to stop at a small level crossing for this train. 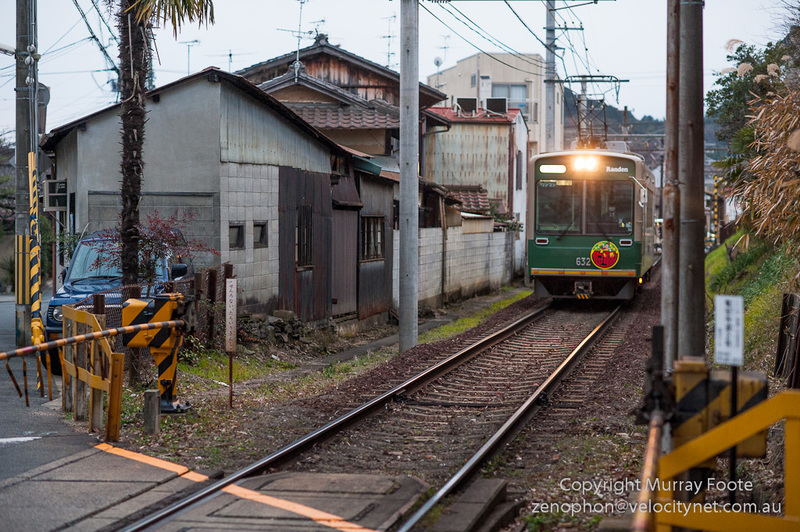 This is a suburban line by a private railway (not Japan Rail). Notice how close the train runs to the houses and the car parked on the other side of the tracks gives you an inkling of how scarce and tight parking places can be in Japan. 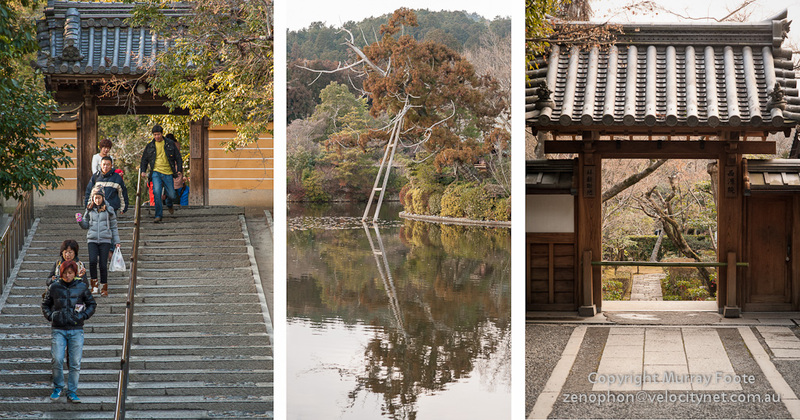 Kyoto is a city of around 1.5 million people and is not far from Osaka, a very large city. 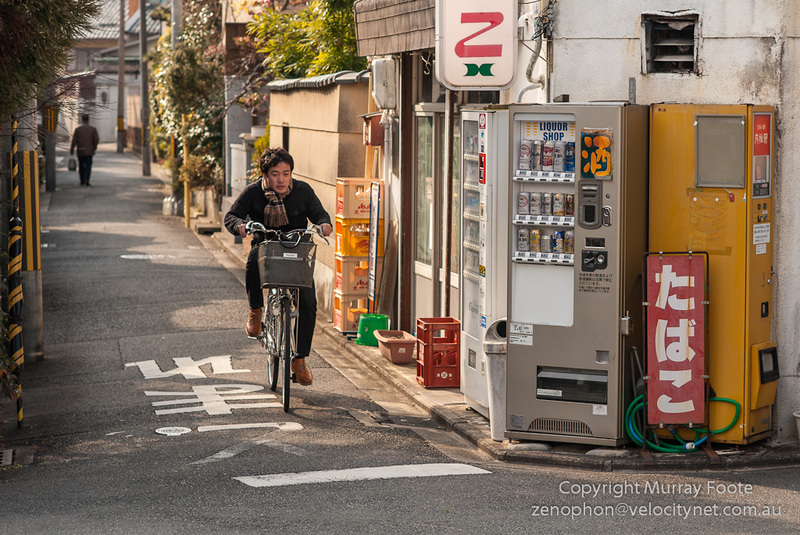 There are many charming side streets with elegant houses and exquisite trees but this is not what we have here, instead, one of the many cyclists and a curious version of the corner liquor store. 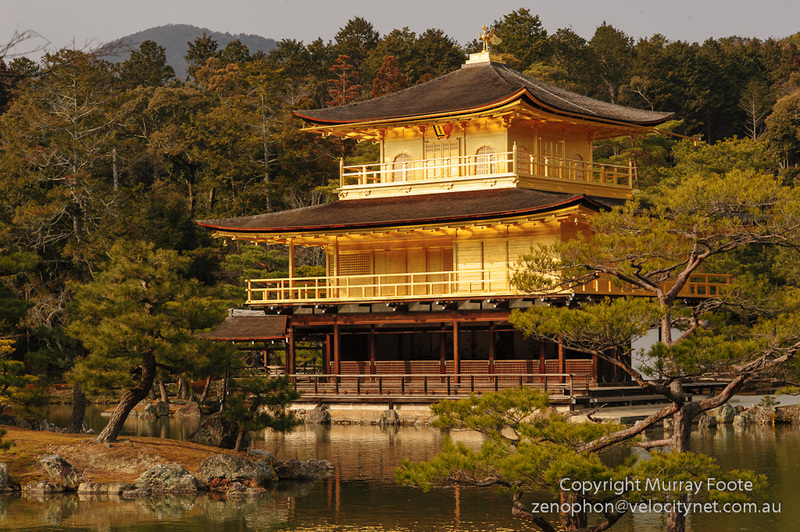 At this time I am walking towards Kinkaku-Ji (the Golden Pavilion). 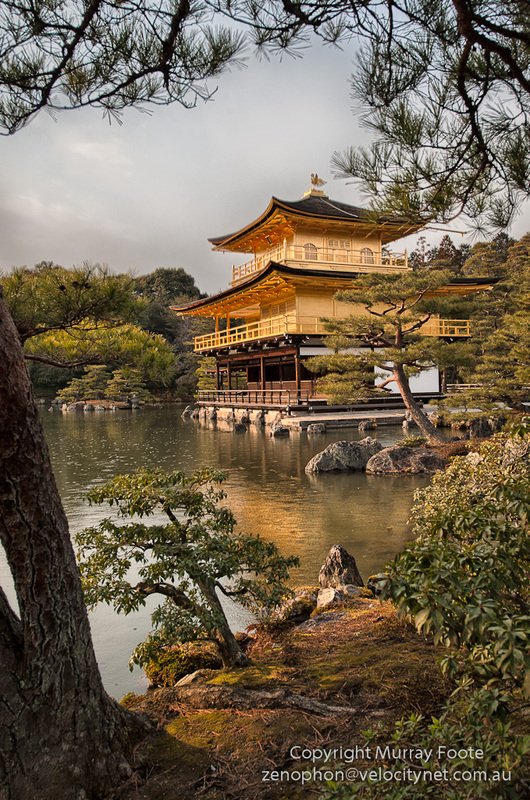 The shogun Ashikaga Yoshimitsu built Kinkaku-Ji (also called Rokuon-Ji) in late fourteenth and early fifteenth centuries as his retirement villa and covered the top two stories in gold leaf. There were also many other buildings at the time that have not survived. 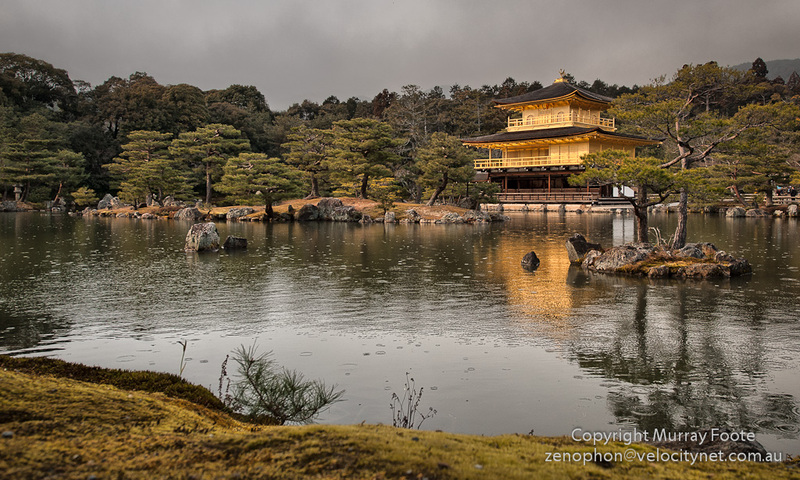 Kinkaku-Ji itself was burned down in 1950 by a renegade monk and later rebuilt. 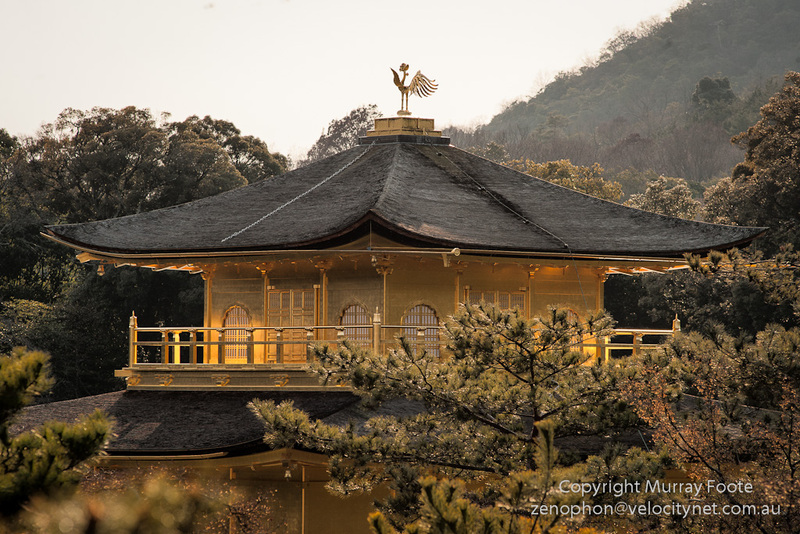 The burning of the pavilion was the subject of a Mishima novel The Temple of the Golden Pavilion. Yoshimitsu was the most successful of the Ashikaga shoguns. Though he handed the shogunate to his son in 1394, he was effectively shogun from 1368 to 1408. Since his grandfather staged a coup against the Emperor there had been two royal courts and intermittent civil war. Yoshimitsu saw the Southern Court (arguably the legitimate imperial line) submit to the Northern Court under the control of the Ashikaga dynasty. Notwithstanding the frequent conflict in this period, it also saw a cultural and artistic flowering that permanently changed Japanese aesthetics. There were several factors that fostered this: freedom from the set ideologies of classical Japan, renewed aristocratic influence due to the return of government to Kyoto from Kamakura, widespread improvements in artisan skills due to breakdown of class roles and decentralisation, and the influence of newer more egalitarian religions such as Zen. In 1333, the emperor Go-Daigo challenged the power of the Kamakura shogun. The shogun charged Ashikaga Takauji with defeating the imperial forces but he changed sides and defeated the shogun. After a brief period where the Emperor had full political control, Ashikaga Takauji took effective control and founded the Ashikaga shogunate. The Ashikaga shogunate was weaker than the Kamakura bakufu had been or the Tokugawa shogunate would become. The feudal system of obligations was less tightly bound and many daimyo had little more than nominal allegiance to the shogun. The old system of moral behaviour was breaking down and individual daimyo became more inclined to go to war for their perceived personal gain, unfettered by a sense of any obligations. The latter part of the Ashikaga period was the Sengoku or Warring States period. This started in the Onin War or 1467 to 1477 where there was a civil war between two clans in and around Kyoto and with battle lines inside Kyoto. It centred on a dispute over who was to be the successor of the shogun, even though the shogunate was not vacant. There was then a period of continuous local warfare until 1600. Paradoxically, this was not all bad. The decline of central control led to more widespread and localised skills, economic development, artistic achievement and literacy. The top of the Golden Pavilion from the hills behind, now in persistent rain. First fixed capital. 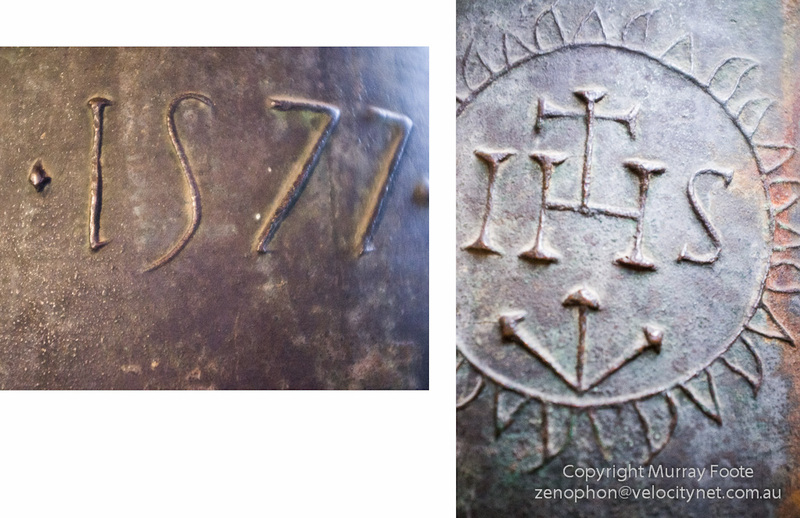 Highly centralised system with strong Buddhist influences. 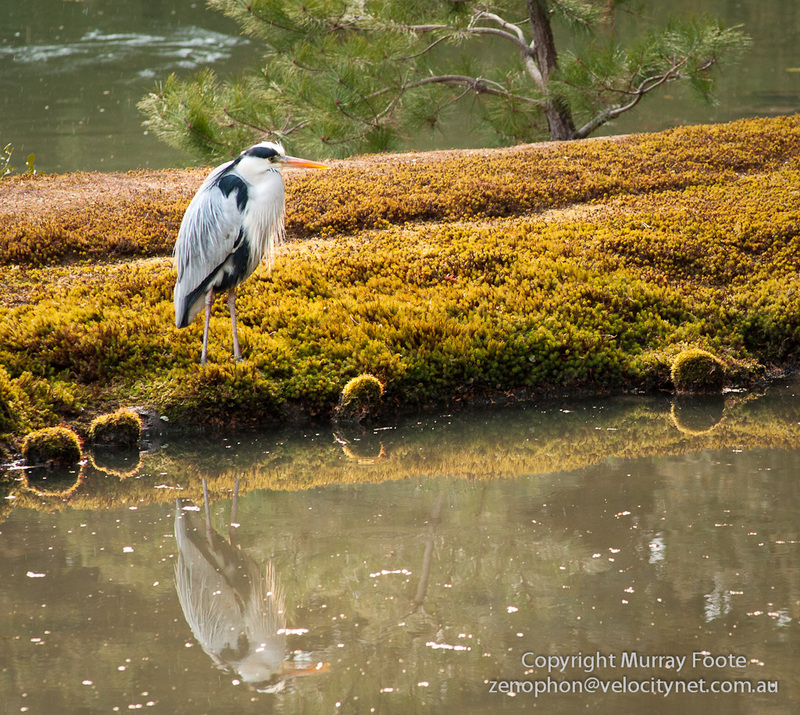 Capital moves to Heian-kyo (now Kyoto) with Fujiwara clan having main power. Centralised power system slowly dissipates. Minimoto Yoritomo seizes effective political power and established a “tent capital” at Kamakura, south of Tokyo (then Edo). Mongol invasions repulsed. Oda Nobunaga, Toyomoti Hideyoshi and Tokugawa Ieyasu (leaders in succession) take effective control over Japan and end the Warring States period. Attempted conquest of Korea and China in 1590s fails. A long period of stability, most of it in isolation from the West.